A diabetic woman in her 80s was admitted to Changi General Hospital (CGH) with a huge pressure ulcer that covered both her buttocks. She had been cared for by a maid who did not tell her employer, the woman's son, of the ulcer when it first started. The maid had tried to treat the damaged area with tapioca powder, which inflamed the wound and made it worse. "It was the worst pressure ulcer I had ever seen," geriatrician Barbara Rosario said of the 2013 case. She has been treating seniors for the past decade and been with CGH since that year. That patient marked "the start of our journey with pressure ulcers" for the hospital, said Dr Rosario. It has shed light on a serious issue facing elderly patients: pressure ulcers or sores caused by friction or prolonged pressure, especially over a bony area, such as the hips, tailbone or ankle. While hospitals do track ulcers that develop when a patient is hospitalised, they need to report only those that are at stages 3 and worse to the Ministry of Health. CGH started checking patients admitted to its two geriatric wards for pressure ulcers in December 2013. Between May and December the next year, 809 patients were admitted to the two wards. Among them, 117 patients, almost all over the age of 80, were admitted with one or more pressure ulcers. Three in four of them were either bed- or chair-bound. The rest were able to move around, though some needed assistance. A smaller number, about 3 per cent of patients, acquired an ulcer while in hospital. But five times that number already had ulcers. The hospital's pressure team also found that such patients tended to stay two days longer in hospital, with almost one in four being re-admitted within the month, compared with one in six patients with no ulcers. Also, the risk of pressure-ulcer patients dying is five times higher than for other patients. Of the 809 patients, 13.2 per cent with ulcers died compared with 2.7 per cent of those with no ulcers. Their bills were also "significantly higher". Said Dr Rosario: "The number of pressure ulcers we are seeing here is worrying and predominantly coming from the community." The ulcers are spotted in various stages of severity - from those with early redness that does not disappear when pressed, to very severe cases where the flesh is rotten and the bone is laid bare. Slightly more than a third of the cases the hospital saw were in the early stage and easily treated. Patients who are bed-bound need to be turned every three hours so they do not put too much pressure on any part of their bodies. "Early intervention is crucial in the prevention of pressure ulcers," said Dr Rosario. But once they get to a bad stage, they may never be cured, even though they may be controlled. Advanced Practice Nurse Png Gek Kheng, one of the four-member pressure-ulcer team, said some families of patients think having a black patch of skin is fine, not realising that it is dead flesh that needs to be sloughed off. Mr Tony Goh, 58, found out about his mother's big pressure ulcer on her spine only when she had a stroke and was admitted. Madam Mary Seet, 84, needed an operation to remove the rotting flesh. She was in hospital for more than half a year. Although her condition has improved, Mr Goh still spends more than $1,000 a month on the medicated dressing that she needs to treat what is left of the ulcer. Q What are pressure ulcers? A Pressure ulcers are damaged skin, and possibly the tissues under the skin. They usually occur over bony areas. In the early stage, they present as redness that does not disappear when pressed. In the late stage, there could be dead flesh all the way to the bone. A Constant pressure at a particular spot. More common among the frail elderly, pressure ulcers can also affect the young who are immobilised, for example, after a fracture. People with poor nutrition are at greater risk because their ability to heal is reduced. Dampness to the skin, such as when a diaper is not changed often enough, raises the risk. The skin can also be damaged by friction caused when a person is dragged, for example, when trying to get the person to sit up at the head of the bed. Q Can they be prevented? •Making sure the person takes in enough nutrition, especially proteins, which are the building blocks. •Getting those who use wheelchairs to get off their bums ever so often, to release the pressure. A cushion could help ease the pressure on bony joints. •Regular toilet visits, for example, before every meal, helps keep the person continent and reduces the risk of moisture-associated skin damage. •Turning and repositioning someone who is bed-bound every two to three hours. If possible, the person should be turned at least twice during the night. The person should also sleep on a pressure-relief mattress. •Using alternating mattresses, which are electrically controlled with an undulating wavelike surface that eases the pressure on any one spot. These cost from $128 each, and there is a 90 per cent subsidy from the Agency for Integrated Care. There is greater awareness of such mattresses, with sales at Changi General Hospital's pharmacy rising to 20 a month this year, from 15 a month last year. When lifting such patients, the easiest way is to have a cotton sheet under them, then pull it to turn them and place a pillow to keep them in that position. A In the early stages, use barrier creams that prevent wetness, avoid putting pressure on the area and ensure there is no skin breakage. Simply standing every hour can help. If the skin is broken or turns dark red or black, seek medical attention immediately. The hospital also offers pictorial booklets on how to prevent and care for pressure ulcers in six languages, including Tagalog and the Myanmar language, to cater to caregivers in Singapore. 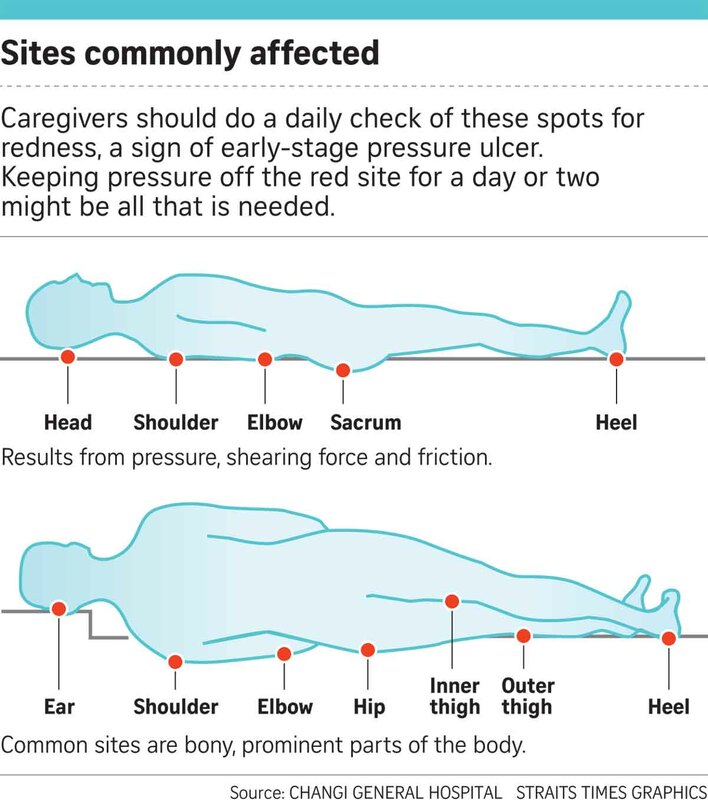 Caregivers, including maids looking after the elderly, should watch out for early signs of pressure ulcers so they can be quickly treated.